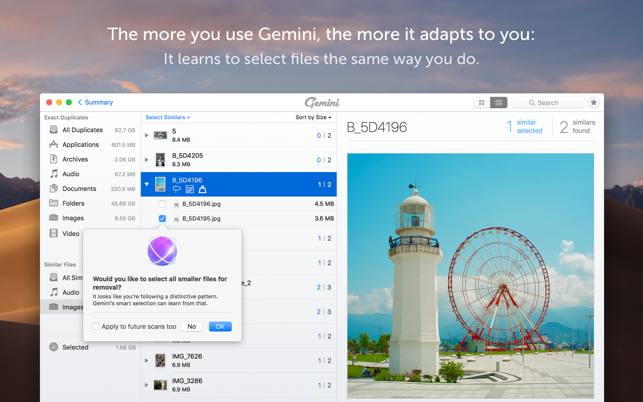 Free up tons of disk space with Gemini 2. 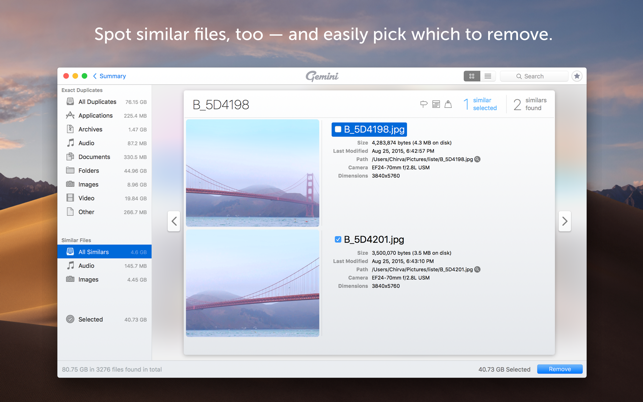 It finds duplicate and similar files in every corner of your Mac, including Photos, iTunes, and even external drives. 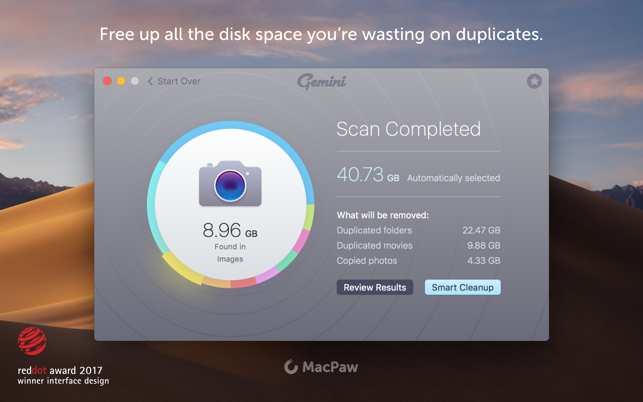 And with the Smart Selection algorithm, you can trust Gemini to remove duplicates correctly and safely. * See if you can spot the Easter Egg! And if you’re wondering what tech reviews say about Gemini 2, wonder no more: we’ve gathered some of them below. Multiple minor improvements and known issue fixed. Great at finding duplicates and similars! I just got rid of over 30G of duplicate files, some of which have been floating around for a decade or more. I found the interface fairly easy to use (though at times got a little mixed up and had to remind myself to select the one I want to DELETE, not KEEP!) It’s great at identifying duplicates… but don’t expect it to be 100% spot on. I did have to make some manual changes after the scan, and that did take a little time, but far LESS time than making a manual comparison to all files scattered across three hard drives. I would recommend always, ALWAYS, visually inspecting all matches before deleting. 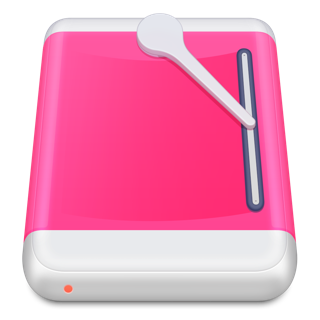 One thing I wish it would do, for when it finds duplicates scattered between two folders, is remember which folder you kept them in (much like it remembers whether you prefer older or newer, higher or lower resolution (or bitrate)). It’s probably a little bit more complex an algorithm to track, so I understand why it’s not part of the patterns it can detect. Also, it would be nice if it could flag any folders that were rendered empty after a purge, but I understand that, too, is probably above and beyond. This review is only for de-duplicating files in the cloud, which is what I needed, and what Gemini 2 can't do, despite what it advertises. I didn't try de-duplicating files on my computer. 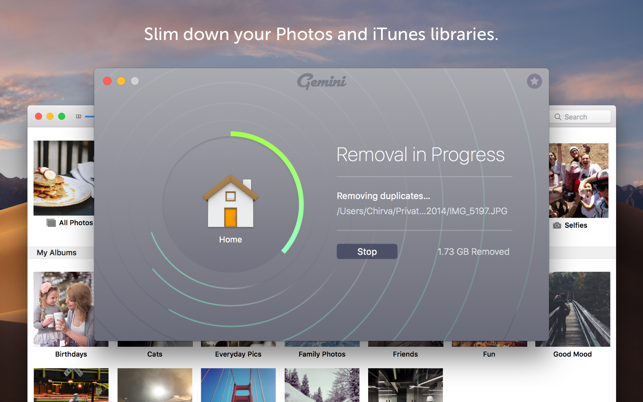 I downloaded Gemini 2 because it says, ""delete duplicates in cloud storage like Google Drive and Dropbox." It can't do that. I tried, eventually wrote to support, and they replied, "there is no possibility to scan your cloud storage with Gemini 2." They suggest downloading all cloud files and then scanning them locally. First, if I had room on my computer for all my cloud files, I wouldn't have much need of a de-duplicator. Second, even if I did download everything, all Gemini 2 could do is delete the additional duplicates that I'd just created in doing so. I'd still have to manually find and delete each corresponding file in the cloud. 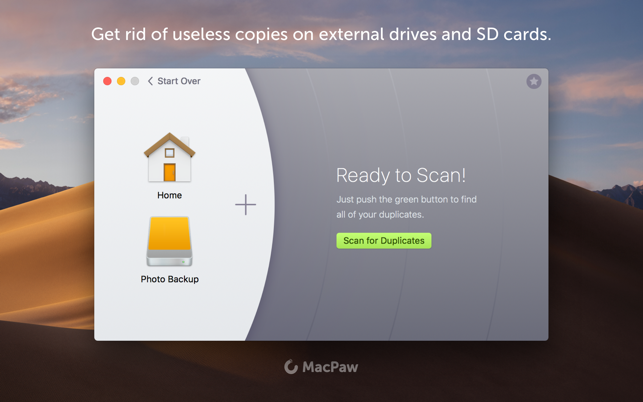 It's not just the app store that makes the false claim -- their website also says, "Duplicates are sneaky, they don’t just live on your Mac’s hard drive. 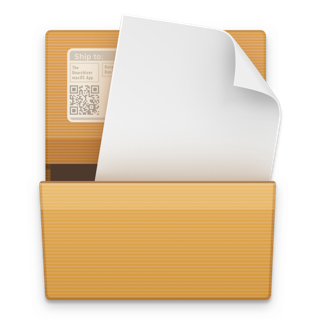 Our duplicate finder scans and locates hidden copies wherever they are... Cloud Storages (Dropbox, iCloud)..." These false statements resulted in a big waste of my time. I was an owner/fan of Gemini vers 1.0 and have recently purchased this version as well. Despite the feedback below, I think its probably the best application for what it does. - The duplicate detection is spot on. I’m always paranoid about it not actually selecting duplicate files. More often than not I trust but verify. I’ve never had it screw up the duplicate finding. - The scanning works quickly. - I’m enjoying the smart behavioral selection feature. - It may be because I have a LOT of files to sort through, but the app crashes a lot with big scans (>50GB duplicates?). - Its very slow sorting through those big scans. - Its tedious to review findings. When sorting I can’t select multiple files within a file set. i.e. if it finds multiple versions of a particular file, and want to manually select or unselect for removal. It has to happen one at a time, and there’s a delay for each one. - I love I can export detected duplicates to a text file, but I can’t actually bring those back into the application to re-process. If there’s a crash it doesn’t always remember my previous selections, and this file export requires me to use another tool to process and remove.